Note the small map, showing clearly the area of coverage of the camera. -TEPCO does not at this time believe that the rain and wind from the approaching tropical storm will cause any severe problems at the site. 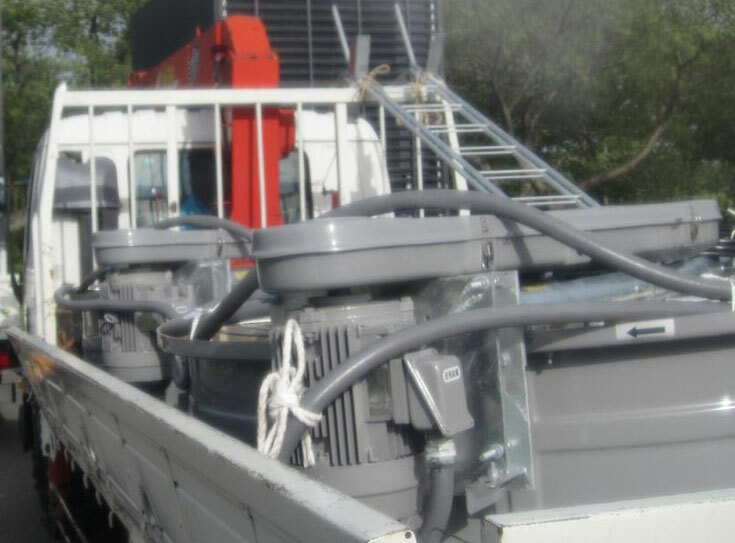 TEPCO had sandbagged a number of electrical distribution panels, and has taken other measures to ensure continuity of AC power during the heavy weather. 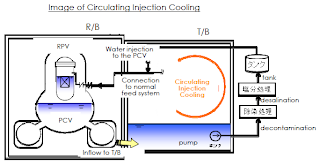 -Cooling injection at No. 3 plant is now solely through the feed system at about 13.5 cubic meters per hour. -Feed system cooling injection has begun at No. 2 plant, at a rate of 5 cubic meters per hour. This supplements the 7 cubic meters per hour from the fire extinguishing line in use previously. -It would appear that further outflow.. from source or sources not yet determined.. is driving up contamination rates again inside the near breakwater. TEPCO is investigating the exact source. -There is some press about the temporary loss of circulating system (seawater) at No. 5 plant driving up plant and spent fuel pool temperatures. There was no serious effect, and plant temperature and spent fuel pool temperature are back on the way down. It appears that no pump was running for as long as 15 hours. 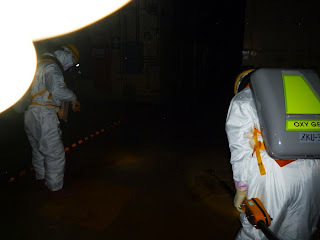 The loss of the pump was first detected at 21:24 on May 28th, according to TEPCO, and work on replacement began at 8:12 the morning of the 29th. At 12:31 the newly installed, spare pumps were started and at 12:49 the normal cooldown lineup was re-established, and cooling of the reactor plant began again. -All four plants, No. 1 through No. 4 now have their spent fuel pool cooling systems restored. These are being used to inject cooling water as needed at the moment, with no recirc cooling capability yet. Recirc cooling (as designed) is expected to be operational for all four plants sometime in July. This removes the need for the long arm concrete spray trucks on a continuous basis, although they remain on site (moved to a safe location due to the impending storm) as backups to the installed (original) systems for spent fuel pool cooling. Tokyo Electric Power Company has released a new video showing the first extensive coverage of the dust inhibitor operations on site. 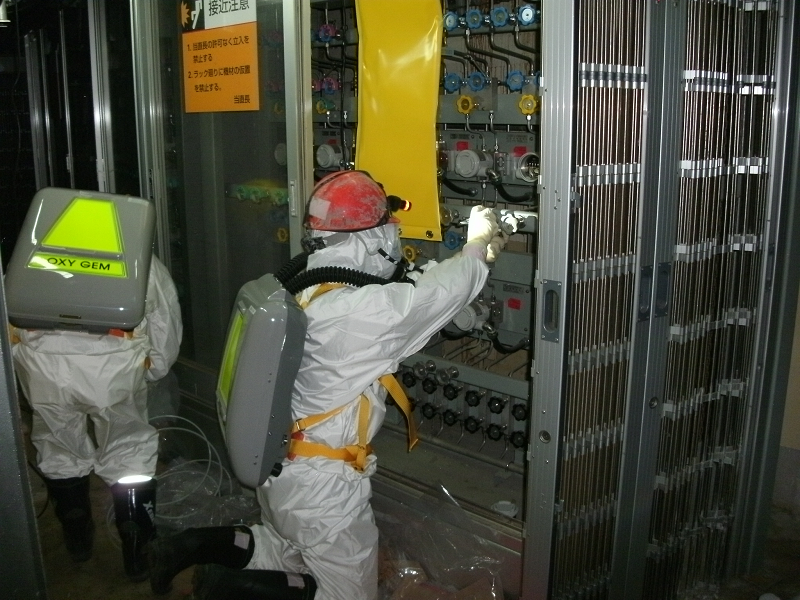 Above and below, TEPCO press photos further depicting these operations. Labels: "fukushima daiichi" "tepco" "video" "youtube"
There is not a lot of news coming out of Fukushima Daiichi at the moment, at least of any emergent nature. 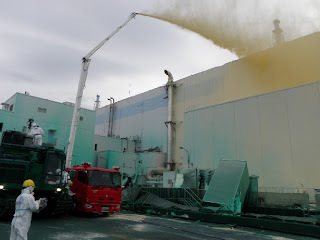 Probably the most important news is that there is a water loss occurring from the waste treatment buildings into which contaminated water was being pumped from the reactor plant turbine buildings. TEPCO has identified some leak points, and where they'll try to stop leakage. 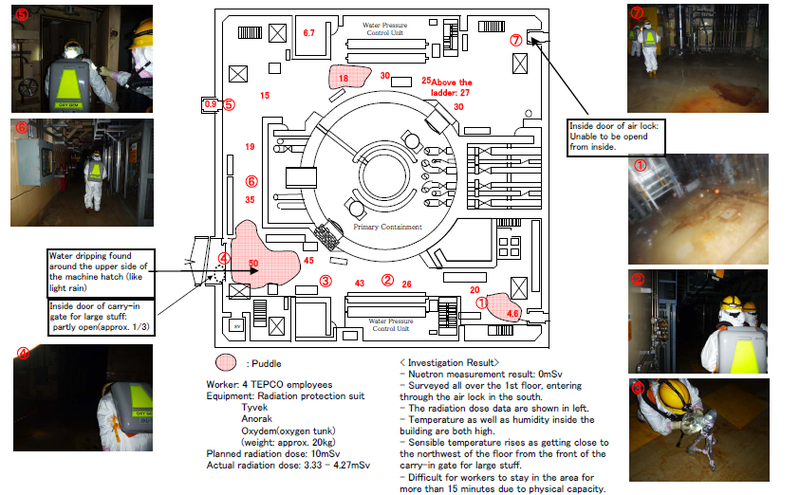 TEPCO's illustration below, which is an overhead view, is fully self-explanatory. Click to enlarge. 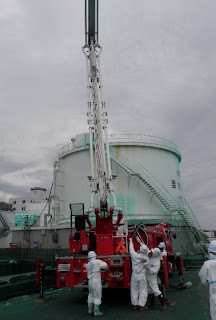 TEPCO sampled the air above the reactor buildings on the 24th using equipment held over the buildings by concrete pumper truck arms. Below, one of the trucks holding the sensor over No. 1 reactor building in a TEPCO press release photo. Below, another truck samples the air over the No. 4 reactor building in another TEPCO press release photo. 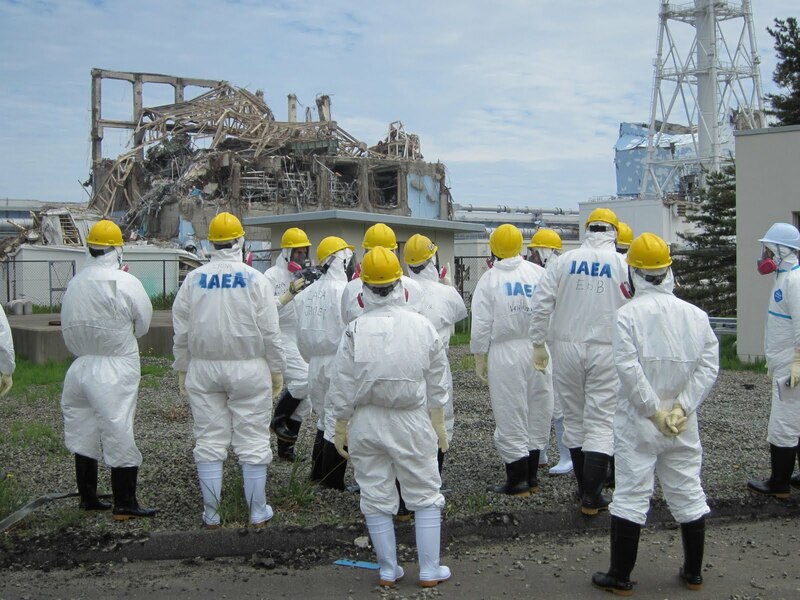 The IAEA has sent an inspection team to Fukushima Daiichi; the team toured practically the entire site, and will make a report to TEPCO on or about June 1st regarding its findings. Below, the group approaches No. 3 (left) and No. 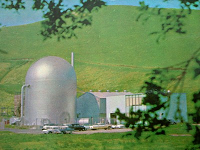 4 (right) reactor buildings on the hillside that is immediately west of these structures. This photo blows up very large when clicked, but is worth seeing in full size and in high resolution. Since we're updating a number of illustrations... We've talked about decay heat removal many many times on this blog, and talked about the need to remove heat for a long time after the reactors are shut down. 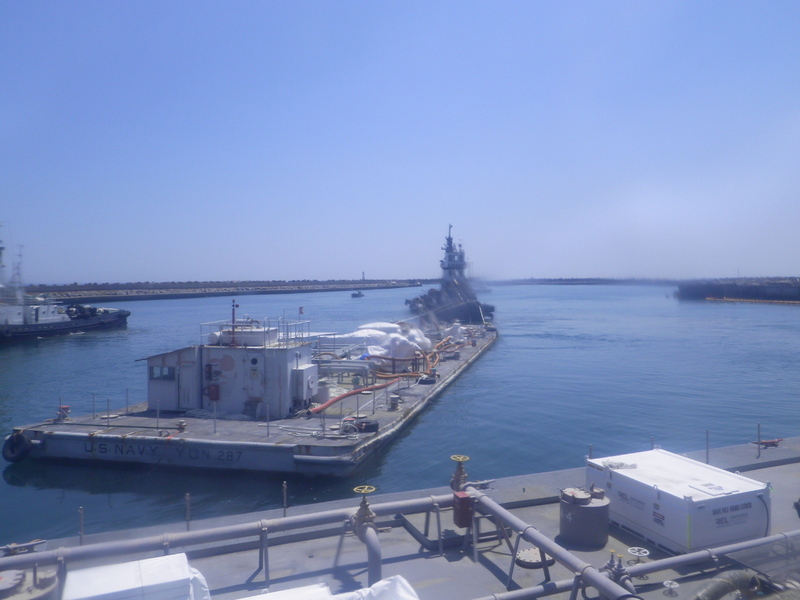 (Long-term readers might remember my quote about how much heat the metal in a decommissioned US Navy submarine power plant gives off due to its irradiation.... THAT is how seriously we've covered decay heat on this blog.) 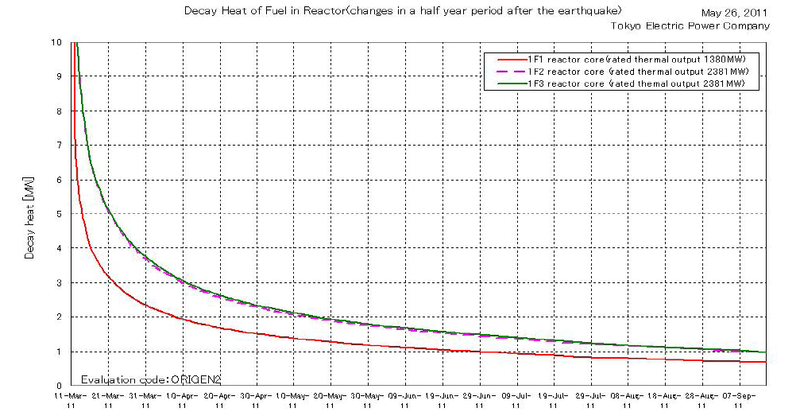 Since we've been so thorough to this end on this blog, we'll finally show a new graph released as a press handout by TEPCO showing the decay heat output curves for plants No. 1, 2 and 3 at Fukushima Daiichi, seen below. This will give a good idea for readers who are new to this blog of how much heat even a shut down core is liberating long after shutdown. Labels: "fukushima daiichi" "tepco" "iaea"
Thanks to Margaret Harding of 4 Factor Consulting LLC, we've been tipped off that Westinghouse has made a public press release responding to the NRC issues with the AP1000 plant. I can't imagine a better, more solid response to what's going on than what Westinghouse has written in this press release. Bravo to those responsible! For great details on the Westinghouse AP1000 plant, see this link which will take you to Westinghouse's website section on this plant's features and design. Westinghouse AP1000 ... Who is on which side? This article smacks of ignorance throughout. Worse, revelation of the content of the "anonymous" letters to the NRC reveals that there's no chance they were written by anyone with any experience in nuclear power of any kind whatsoever. In other words, they're not whistleblower letters. They're anti-nuclear activist letters. "I find it amusing to hear Mayor Stoddard claim that the NRC never says no. Since it was split from the Atomic Energy Commission in 1974 and formed as a regulator with no responsibility to enable the development of nuclear energy, there has not been a single nuclear energy facility proposed, licensed and started up. NOT ONE. Perhaps Stoddard is correct that the agency never says no, but their passive aggressive stance of never saying yes and asking an unending line of questions even on a design like the AP1000 that has been extensively reviewed for close to a decade is painfully effective at scaring away all investors and developers. When I read about people fighting to make sure that nuclear energy facilities are absolutely, perfectly safe against any potential outside forces - real or imagined by anonymous whistle blowers - I wonder if they apply standards that are even remotely close to that for coal, oil and natural gas facilities? No matter how much non-nuclear alternative energy sources are promoted and advertised by corporations like GE, BP, Shell, Chevron, Vestas, Iberdrola, Next Era, and Siemens, the facts born out by reality are that Florida has just 4 choices for reliable, affordable electricity - coal, oil, natural gas, and uranium. The highest point in the entire state is less than 400 feet above sea level, so hydro (falling water) is out. The state has no geothermal sources at a high enough temperature to spin turbines, so that is out. The wind and sun only work if the weather is right - and we all know that weather changes without any control signals from human beings. Anyone who thinks that it is safer to obtain electricity from coal, oil and natural gas instead of uranium needs to recall just how many times every year people die in accidents associated with those competitors to nuclear energy. It makes me wonder who the people fighting nuclear energy are working for. Coal, oil and natural gas interests earn tens of billions of extra dollars every year by selling more expensive, polluting fuel when emission-free nuclear energy is not allowed to compete. The only hope anyone would have had for calling any government agencies or committees pro-nuclear ended with the disbanding of the Atomic Energy Commission in 1974 and the dissolution of the Joint Committee on Atomic Energy a few years later. 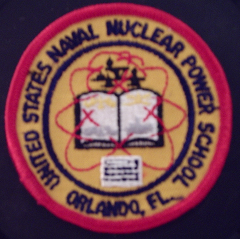 Since that time, there have been NO ... repeat... NO government agencies actively promoting nuclear energy, and in fact many of them trying to stop it. Rod is absolutely correct when he says that NOT ONE plant has been built as a result of an application first received by the NRC. All of them were received by the AEC prior to the formation of the NRC in 1974. The closest there is to pro-nuclear in the government is the DOE's nuclear office, which is now in the link list for this blog. Ever hear of them? Most folks haven't. But they all know who the NRC is! Let's hope all of you who read the story from the Miami Herald, Rod Adams' comment and my few added comments here now have a solid picture of what is really going on. 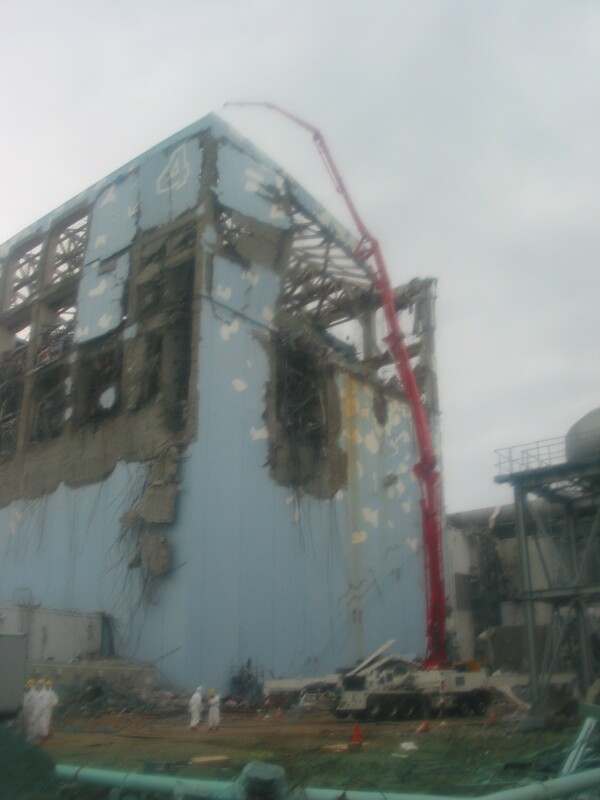 Some further Fukushima Daiichi updates. First, on the wires right now, an indication that TEPCO is saying that the pressure vessel at No. 1 plant was damaged immediately after the earthquake... Only Kyodo News is carrying this at the moment, and it may duplicate the 18 hr damage estimate we've seen previously. TEPCO will be installing a heat exchanger for the spent fuel pool at No. 2 plant immediately. Water transfer at the site is becoming problematic, as it appears that storage capacity is being outrun by contaminated water volume. This is probably driving the continuous rate reduction at No. 3 plant. I'm looking at a quite massive and detailed release by TEPCO at the moment, concerning immediate post-quake and post-tsunami details, parameters and actions and will report on this if anything in it differs from what we've been told so far, or if anything important jumps out. Labels: "fukushima daiichi" "tepco" "nisa" "jaif"
There are two news stories of interest coming out of Japan at the moment. We'll tackle them in our usual fashion. First, TEPCO is now reporting failures at the bottom of all three reactor pressure vessels; this is being carried for the moment only on the major Japanese news media and has not appeared in TEPCO's press material as of yet. I reported on this blog a very long time ago the high percentage of likelihood during a long-term SBO event that damage at the bottom reactor pressure vessel head would occur. I believe I even mentioned this on the radio interview that Fintan Dunne performed, wherein I was a guest. It should be noted that TEPCO is reporting equivalent leakage from a single theoretical hole, and that the real failures are probably around control rod drive penetrations, from some cracks, and maybe around pipe penetrations so that there isn't one single large hole but a scattering of smaller failures. A long time back this blog was the first to introduce to the general public the 'inside' term of "feed and bleed" to describe what was occurring at Fukushima Daiichi; that essentially being the cooling of the cores by continuous injection of water from new sources, with water loss occurring at some or other point or at multiple points. This is of course different from recirculating cooling, where water is moved in a loop. So, then, for readers of this blog this is not an entirely new revelation in the sense that for a long time we've been wondering exactly how the water was getting out of the reactors. In summary, then, it's not really a surprise, given the known facts about long-term SBO accidents (core damage in hours, core melt through pressure vessel as a possibility starting after ten hours or so, which varies by plant and by actual timeline of events) and the known release of water if there is in fact serious failure at the reactor pressure vessel lower heads, or possibly the area of the vessel just above them. 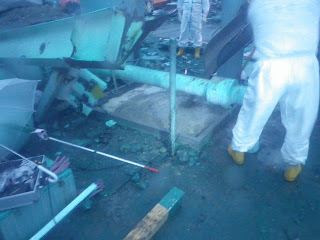 TEPCO performed a number of steps early on that made us suspect that TEPCO suspected serious core damage; for example, the very early drywell flooding is something you see when the operators are trying to prevent or delay failure of the pressure vessel by its contact with melted fuel. Only later did drywell flooding come about again, this time as a part of the attempt to fully cool the cores; early on it was an accident mitigation strategy and not a recovery strategy. 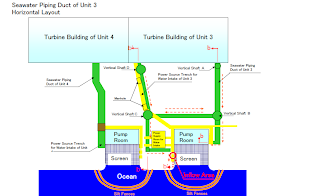 Events at Fukushima Daiichi, studies done over many years (primarily by ORNL), and operator actions at Fukushima Daiichi have pointed to serious failure in the pressure vessels or piping for some time now. The reason this is important theoretically is that if it were true you would then have to consider the plant also in a LOCA scenario (Loss Of Coolant Accident) in combination with the SBO scenario. This seems a small difference but is a major difference in the analysis of how to handle the situation, and how to prevent an occurrence in the future. But before we jump to conclusions we need more solid data from TEPCO who, to repeat, is not saying that the earthquake damaged the system as of yet. We will certainly keep an eye out for clarification on this issue. More to come later on today. Well, as expected at some point, we now have a statement by TEPCO (right now only seemingly carried by Kyoto News) that the reactor cores in No. 2 and No. 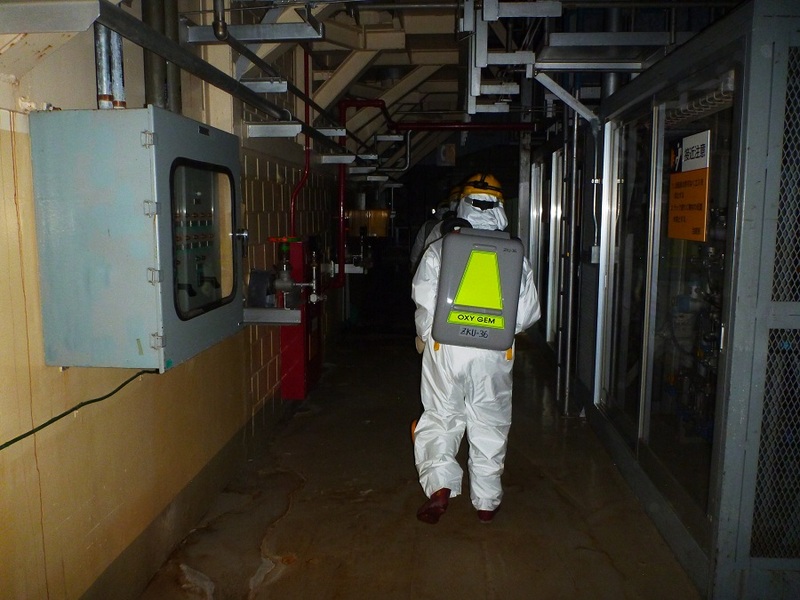 3 plants at Fukushima Daiichi are partially melted down. The story says that this information is "updating its earlier assessment that just the No. 1 reactor suffered critical fuel melting." That's not true, and Kyoto News should know that. Not only has TEPCO assumed core damage at the plants since very early, this blog and many others have reported it. The JAIF daily status reports have shown probable core damage at all three plants for a long time. We've archived a number of these; the March 14th JAIF status shows core damage at No. 1 and No. 3, with No. 2 listed as "unknown." The March 16th JAIF status update downgrades No. 2 plant to fuel damaged status as well... like the other two. In other words, considering that the JAIF was getting its information from best-guess estimates from TEPCO, and NISA, there's just no basis at all to make any statement that this is the first affirmation of core damage .. call it 'partial melt' if you like .. for all three plants by any stretch of the imagination. Further, this blog carried many mentions of SBO accident scenario studies indicating serious core damage being highly probable given the circumstances. "Serious core damage" translates along the event line to melt, by the way. As such, while this "news" story is on the wires and will get legs, no one should be surprised or further alarmed by it. As has become the case in the last few weeks, with the plant conditions stabilized, the train of press releases and other news items from Fukushima Daiichi grinds to a halt over the weekend, and then starts up to full speed again on Monday. Of course, work at the site, at TEPCO HQ for planning, and at Japan's NISA and other offices doesn't stop over the weekend, meaning that there is usually a lot of catching up to do on Mondays. This Monday is no exception. First, keeping up with a trend we've been following the last several days on this site, it seems TEPCO is continuing to back off injection rate at No. 3 plant. Today we have the news that TEPCO reduced the injection rate through the firefighting line from 6 to 5 cubic meters per hour at 11:31 AM on the 23rd, and then further reduced it to 4 cubic meters per hour at 2:08 PM. Thus, the total injection rate is the combined 4 from the firefighting line and the 12 through the feed line giving 16 cubic meters per hour... still more than the 6 and 7 cubic meters per hour at No. 1 and No. 2 plants, respectively. Temperatures at last available reading were still stable on No. 3 plant. 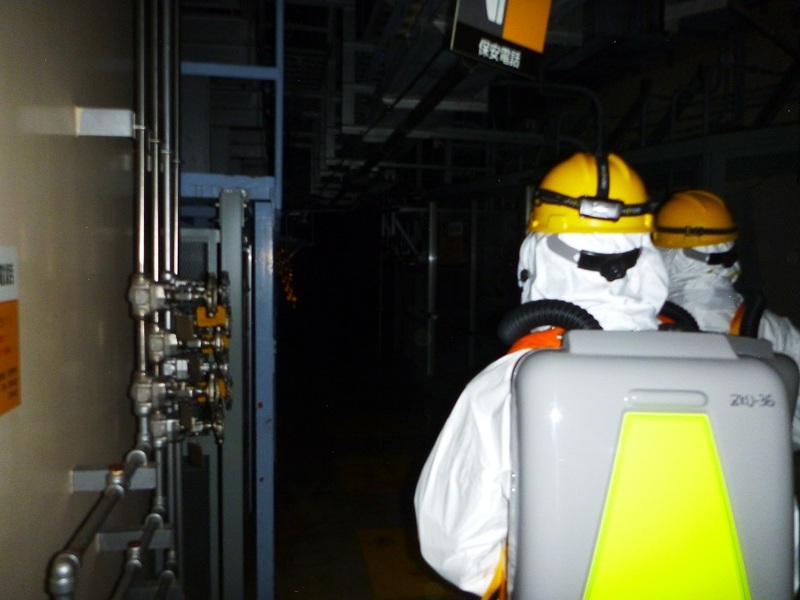 -TEPCO has begun performing air sampling around and above the reactor buildings, to check for airborne release. This will be reported to NISA. -TEPCO has launched its effort to gusset, or support, the spent fuel pool area of the No. 4 reactor building. Shielding has been brought in to reduce exposure to the workers who will begin installing steel columns to hold up the pool, whose floor will be reinforced (from underneath, not from inside) with a layer of concrete. -TEPCO is expected to submit a report to the Japanese Government today which will apparently assert clearly that there was NO damage to the reactor plants as a result of the Great East Japan Earthquake. Plant data charts and tapes, and debriefing of employees are TEPCO's evidence. The damage sequence began ... as this blog has asserted time and again since being among the very earliest to do so ... when the tsunami hit and triggered an essentially unrecoverable SBO accident scenario. We will have details of this report here when it comes out. Similarly there are reported to be a number of new photos and a video which TEPCO will release at some point, and those will either appear here or else on the Atomic Power Review YouTube channel. -TEPCO has decided that reducing the temperature of the spent fuel pool in the No. 2 plant will drastically lower the ambient humidity in the reactor building... and so will install a new heat exchanger for the spent fuel pool's cooling as soon as possible. Reduction in the humidity will make work in the building possible by people rather than just by remote controlled robots. Finally, for this post... Many people have commented and e-mailed about the report that TEPCO operators shut off the isolation condenser cooling system that was in use at No. 1 plant after the loss of power, when it was the primary heat removal system in such a situation. I have not commented on this as of yet... as have I also not commented on NHK News saying that it has a "copy of the Fukushima Daiichi Operating Manual" and can prove improper operation... because there simply are not enough solid details available yet. On the No. 1 plant cooling issue, supposedly the operators shut the system off and then it took several hours to restore any sort of core cooling. On the NHK-asserted improper plant ops issue, supposedly the operators didn't vent the containment anywhere near early enough and violated operating rules during the casualty by not doing so. Both of these are serious accusations. Apparently TEPCO is looking seriously into the first, while it has not commented on the second. Frankly, I don't know what documents NHK has in its possession... and if someone unfamiliar is reading any sort of actual operations literature it's sure to be misinterpreted. It is not my desire to "blow off" accusations, but in both cases we simply do not have any solid information from TEPCO on validity or effect. Until we do there's little point in analyzing such things and playing the blame game. If it comes out that TEPCO operators were incompetent, I'll certainly be printing that here because first and foremost in importance for the long-term is to understand all of the contributing actions and events that led us to the Fukushima Daiichi Accident as it stands right now. Operator error almost always figures into accidents; the question here is how, and when.... as long as there is more proven than an "if." 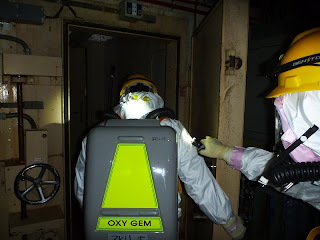 As reported on this blog on April 23, TEPCO has (again) noted the discovery of radioactive debris on the Fukushima Daiichi site which is emitting between 90 R/hr and 100 R/hr. This debris is near the No. 3 plant reactor building, reportedly, and as noted before is the highest dose rate found on site yet.. that is, outside of the plant buildings, anyway. TEPCO has reduced the feed rate to No. 3 reactor again. According to the TEPCO press release, flow rate through the feed line has remained constant today at 12 cubic meters per hour, but feed flow through the firefighting connection has been reduced in steps. At 5:39 AM this was reduced from 9 cubic meters per hour to 8; at 8:43 AM to 7; and at 11:54 AM finally to 6 cubic meters per hour. Thus, as of now the total feed rate to No. 3 is 18 cubic meters per hour. No. 1 plant, for comparison, is at 6 cubic meters / hr while No. 2 plant is at 7 cubic meters / hr. 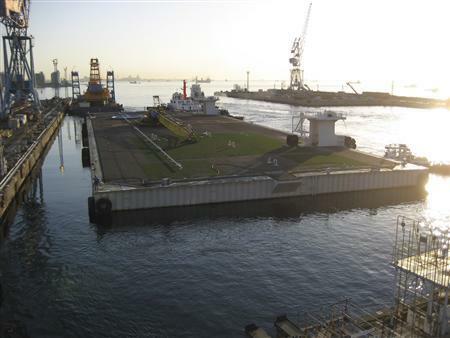 The "mega-float" barge is now at Fukushima Daiichi. 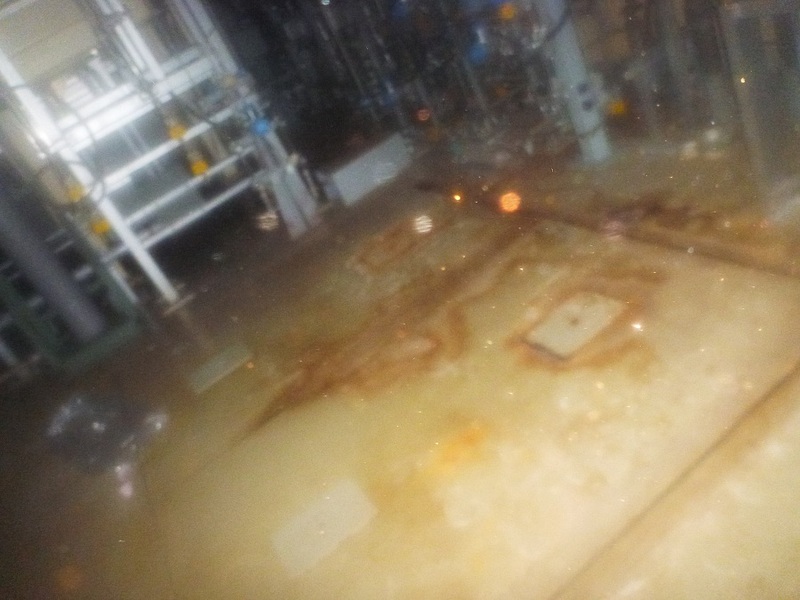 TEPCO has released photos taken at Fukushima Daiichi as the tsunami hit. I've assembled them into a slide show movie and the sequence is now available on the Atomic Power Review YouTube Channel. Link to new video below. In other news... TEPCO has further increased the rate of water injection to the reactor at No. 3 plant at the Fukushima Daiichi site. TEPCO is now injecting a total of 21 cubic meters per hour to the plant; 9 through the fire extinguishing line and 12 through the feed system. 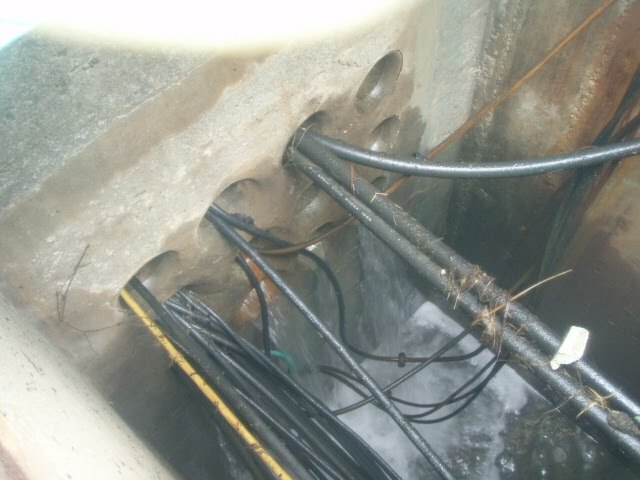 Prior to today, the rate had been 18 cubic meters per hour, 9 each system. This rate had existed since May 17th, when the feed line was increased from 6 to 9 cubic meters per hour. The feed line was added to the fire extinguishing line as a source on May 12th. This continuous increase is of interest; also of interest is the injection of 180 kg of boric acid on May 15th from 14:33 through 17:00. Soon after this, there appears on the temperature tracking graphs released by TEPCO a sharp rise in a number of temperatures, particularly those at the top of the RPV but also at least one related to a downstream (tailpiece) temperature reading on a steam relief valve. There was also a drop in RPV indicated water level that this increasing of feed rate has corrected.. the drop in level occurring before the borated water was added. I'm both looking for more details on this and waiting for another TEPCO press release that might mention their thinking.. and their suspicions. One further note released by TEPCO which is not particularly surprising is the discovery of about 12 feet or so of water in the reactor building basement at No. 1 plant. I say not surprising, because everyone knows by now that the water is going somewhere after injection.. and that string of "somewheres" starts in the reactor building. 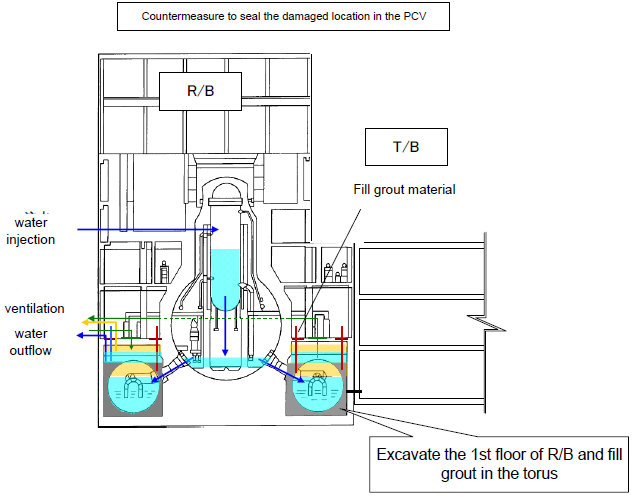 Finally for now... TEPCO has a diagram showing what exactly it means when it says that it will apply grout to the suppression chamber ("toroid") at No. 2 plant. Essentially, TEPCO intends to fill the whole room with concrete, it appears, from the illustration below. This will seal the chamber and allow recovery vis a vis cooling of the core to go forward. Labels: "fukushima daiichi" "tepco" "tsunami"
TEPCO has made a press release stating the fact that at a meeting of the board of directors of the company, TEPCO has decided to decommission Fukushima Daiichi No. 1 through No. 4 and has also decided not to build the planned No. 7 and No. 8 plants at the site. That's old news... look at this post from this blog dated April 17. What is interesting about this press release is the fact that Fukushima No. 5 and No. 6 are not mentioned. I noted in the post I linked above that the long-term TEPCO plan released for the press did in fact mention defueling of No. 5 and No. 6 plants. TEPCO has, as of yet, not come out one way or another solidly in a public manner with a determination on these two plants. The TEPCO plan document (pdf) I referenced in the above post included 5 and 6 but this was never otherwise publicly commented on by TEPCO that I saw; now, this report from the board of directors totally fails to mention these two plants one way or the other except to say that they are successfully in cold shutdown and are compared in status to the four plants at Fukushima Daini. Can it be that TEPCO is still considering returning these two plants to operation? That would be an incredible revelation -- not for any technical reason, but for the simple fact that TEPCO would obviously be so totally clueless about public perception if that were their thinking. Surely the Fukushima Prefectural Government will never allow it. Below, the full text of the TEPCO press release, dated May 20, 2011. Taiheiyou-Oki Earthquake that occurred on March 11 2011.
explosions. Hence, the decision to decommission them was made. will continue to consult with the government and relevant authorities. Power Station, have been successfully brought to a cold shutdown. Apparently, high seas are keeping the mega-float barge from getting farther than Onahama. There is no word as to when it will leave that port for Fukushima Daiichi. TEPCO has made a press release covering photos and rad levels found inside the No. 2 reactor building. 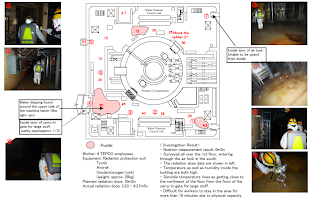 Here is TEPCO's survey of the first floor. Note the photo location numbers on the photos on the sides, and the locations of those photos (the circled numbers) on the diagram of the first floor. Here are the seven photos released by TEPCO, larger than above for better viewing. Click any of them to enlarge.... this applies to the diagram above, as well. According to TEPCO, rad levels inside No. 2 aren't as high as expected... although there is certainly one hundred percent humidity, hampering visibility. TEPCO also (according to NHK) has sent two men into No. 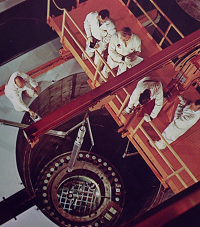 3 reactor building, where the men did find during a ten-minute examination rad levels of between 16R/hr and 17R/hr near the containment vessel access door. All of these entries are, of course, to perform the initial surveys required to establish stay times and possible installation of shielding, temporarily, to get water level indication restored, to prepare for nitrogen injection, and to prepare for the new cooling operations. Water level indication and nitrogen injection are already achieved (nitrogen for a long while now) at No. 1 plant. As might have been expected, there seem to be higher levels of seawater contamination right outside the plant (but inside the break wall) that probably coincide with and are due to the very much increased rate of injection to No. 3 reactor.. now through two paths. This has driven temperatures down considerably; in fact, the last reading I saw showed feed nozzle temperature below lower RPV head temperature for the first time. TEPCO is investigating the leakage. The "mega-float" barge which has been modified for use by TEPCO for the storage of contaminated water has apparently started toward the Fukushima Daiichi site. 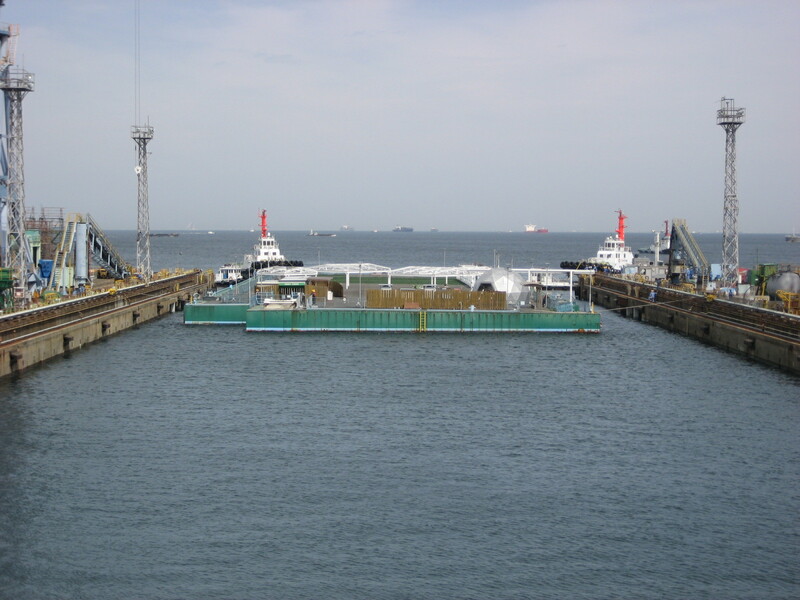 The TEPCO press photo (seen below) is of one of the two USN freshwater barges leaving Fukushima Daiichi under tow; perhaps this is to clear the dock space for the mega-float. The massive "mega" barge had formerly been used as a type of floating park, with shelters on the top and even what appeared to be a concession stand. All of this was removed, and a crane is now topside. Below, the internal bulkheading of the barge was modified per TEPCO direction to better adapt it for its new service. Below is the mega-float as it looked when arriving at Yokohama. And, below is the mega-float on March 15th. In other developments, according to Japanese news sources, while several men did in fact enter the No. 2 reactor building to perform an inspection (determine physical condition of structure and access, condition of equipment, survey for restoration of the water level indication, etc.) the men were forced to leave the reactor building after only 14 minutes because the building is full of steam. This was exactly the problem that halted robot inspection of the building a while back; the robot's camera lens fogged and the operators backed it out the way it came in. Of course, we must assume this steam is coming from the reactor pressure vessel originally, and then is being released though who knows what possible release path. TEPCO's assumption for a long time now has been that there was an internal explosion which damaged the primary containment vessel. Hydrogen is the leading culprit, but a steam explosion is also a remote possibility. Surely now there's no doubt that the primary containment is in one or more locations, and in one or more ways, compromised. This will make recovery of the No. 2 plant much more complicated. Dual injection paths continue in use at No. 3 plant, and temperatures continue to lower slowly. Finding the issue with pressure vessel integrity at No. 1 plant, and suspecting strongly (and I agree) that similar situations would exist at the other two plants in question, TEPCO has revised its concept for recirculating cooling. 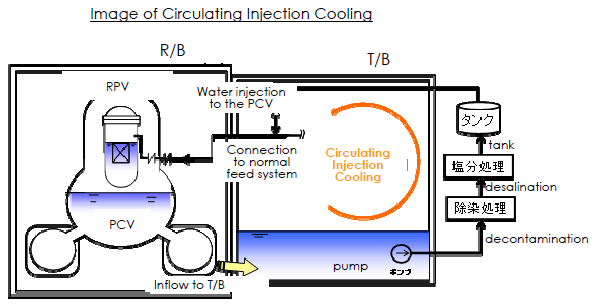 TEPCO will use an essentially open-loop cooling circuit with buildings used as hot/contaminated water reservoirs which will then be tapped by the cooling system. The water will be cooled, filtered and then pumped to the reactors through the feed systems. 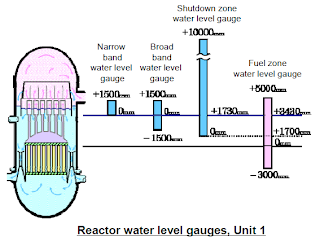 TEPCO illustration below shows this setup schematically. There is no exact date for this work yet; TEPCO has not even seriously entered No. 2 and No. 3 turbine buildings yet to survey the equipment, according to latest reports. TEPCO is working on a very massive report to be released soon; the report already exists in Japanese. This report (which I've seen) has very many primary parameters from actual recording equipment taken from right before the quake to as long as the equipment ran. 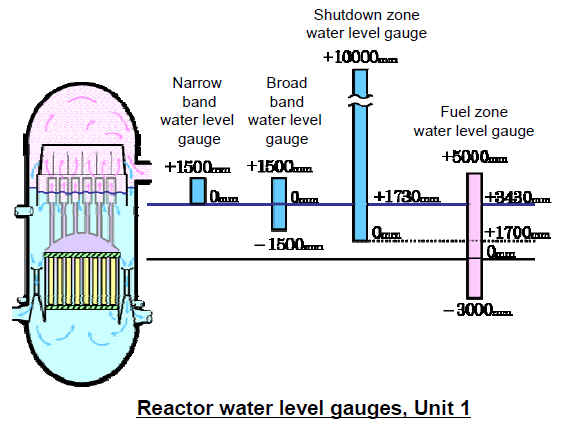 While this isn't out yet, TEPCO did release some illustrations of one specific strip chart recording for each plant showing reactor pressure and reactor water level. The water level didn't record for No. 1 plant, but it did for the other two. TEPCO's illustrations are below, and are self-explanatory except for two things: First, "scrum" should be "SCRAM." Second, the strip charts read from RIGHT to LEFT, so follow the numbers. Interesting to note is how long the recording equipment operated at No. 3 plant.. apparently a good deal of time after the tsunami.. while the parallel type of equipment ceased fucntioning at No. 1 and No. 2 plants at the time the tsunami hit. Below, a TEPCO illustration that applies to their No. 1 plant showing what some of the different water level indications normally available are, and how the indicating ranges overlap each other. This is the first exactly specific diagram like this we've seen from TEPCO, and if they appear for the other two plants I will post them as well. TEPCO Press Release video showing a very long tour of the Fukushima Daiichi plant, shot on May 6, is now available on the new Atomic Power Review channel on YouTube. Labels: "fukushima daiichi" "tepco" "video"
As expected, there are a number of news developments from TEPCO and the Fukushima Daiichi site. 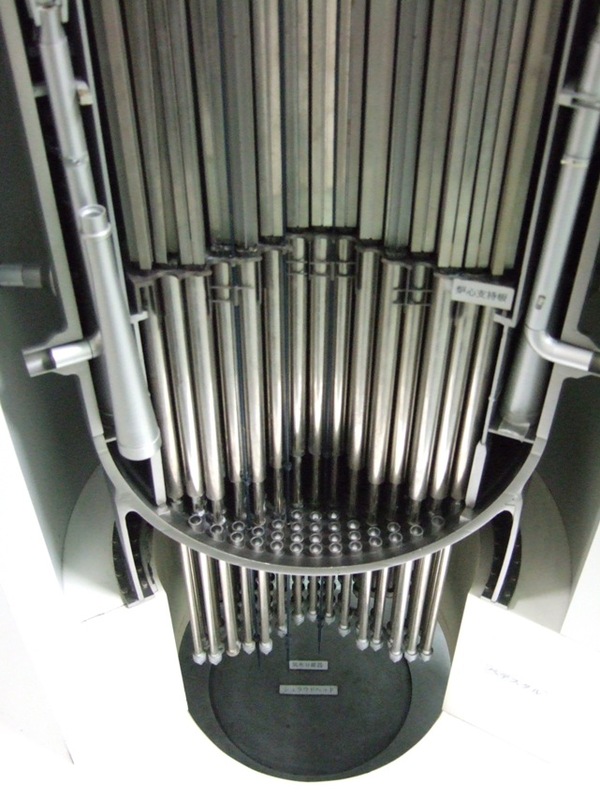 TEPCO has revealed the fact that the isolation condenser cooling system (fitted to the oldest plant, No. 1) was shut down within ten minutes of having been actuated automatically after the earthquake. The shutdown of the system is suspected to have been done manually. TEPCO is investigating to discover if this is actually the case, and if so, why the system was shut down. There is speculation that the operators found its operation suspect or unsatisfactory, or were alarmed by the pressure drop in the system. The water injection rate at No. 1 plant has been reduced back to six cubic meters per hour. TEPCO is analyzing the results obtained during the period of higher injection rate. As one might expect, there is wide speculation that the cores at No. 2 and No. 3 plant aren't in any better condition than that at No. 1 plant. For the second time in a week or so, TEPCO has injected borated water into No. 3 plant. This plant has been using two different simultaneous injection paths for a number of days now to try to drive temperatures back down - one firefighting connection and the normal feed system piping. This is of some interest, since the only reason to inject borated water would be due to a fear that increased fission rate is occurring. Considering that in these plants, from what information we have specifically been able to gain, the control rods would melt BEFORE the fuel would melt, it's possible that TEPCO is thinking the rod material is perhaps more at the bottom of a mixed mass of corium. Finally (for this post, that is) TEPCO is apparently roughly sticking to its original timeline for site recovery.. with plants stable and cooled in six to nine months. A number of additional areas of concern have been merged into the recovery plan, but the overall time expectations are stated by TEPCO as workable. We have more information and updates in progress. This is a companion post to a previous post. 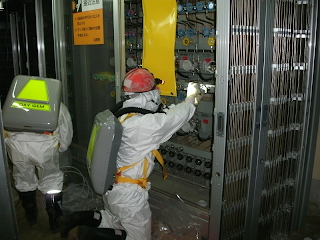 Click here to read the post about reactor core conditions at Fukushima Daiichi No. 1. 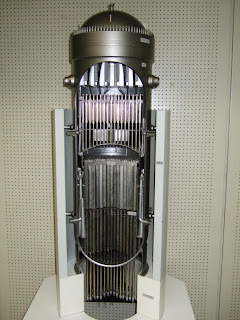 A previous post made, but lost due to a blogger.com software data corruption failure, included two TEPCO press photos which show a fairly elaborate model of a BWR reactor pressure vessel. Here again are those two illustrations. The second is only a closeup of the lower head detail. These are from AEC/NRC reports, primarily WASH-1082 and WASH-1250 in the APRA collection. ABOVE, diagram of reactor internals generally applicable to BWR/3 and BWR/4 cores. 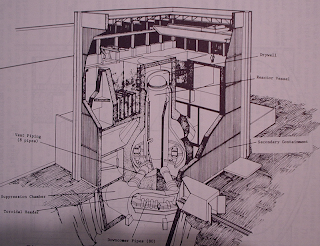 ABOVE, Mark I containment layout including reactor building. 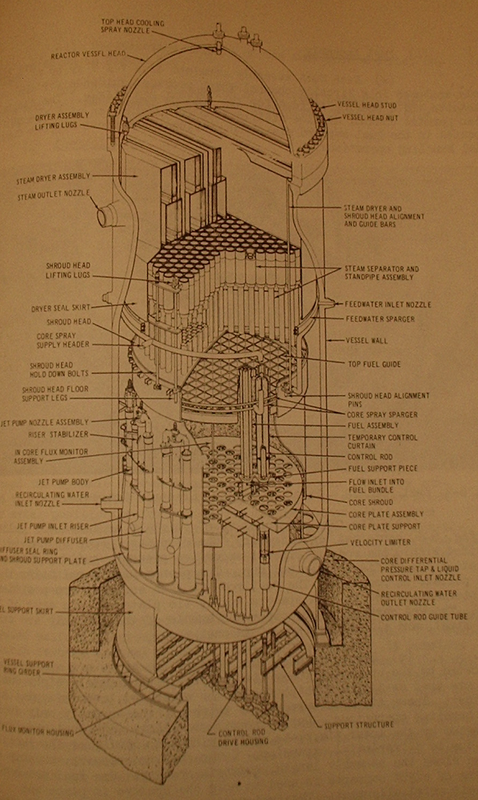 Cross section view; from WASH-1082. 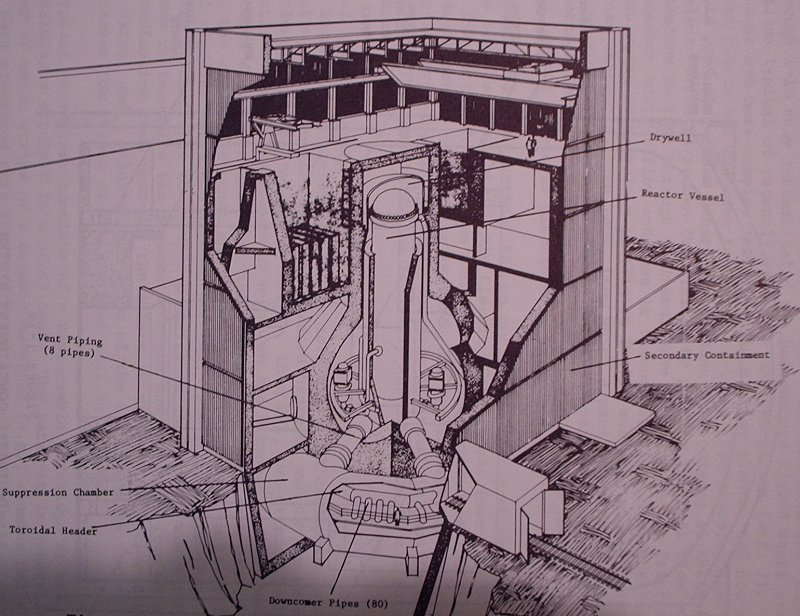 ABOVE, perspective of primary and secondary containment construction and reactor building from WASH-1250. These illustrations will help those new to this terminology and new to reactor plant construction in understanding the press reports and reports here. Readers should be reminded to click all pictures above to enlarge; also, use the Google search feature on this blog to find more information in many past posts. Labels: "fukushima daiichi" "tepco" "dry well" "containment" "pressure vessel"
Be sure to see the previous post on this blog regarding the apparent total derangement of the reactor core at Fukushima Daiichi No. 1 plant. The following updates are in addition to that important information. -NHK is carrying the line that TEPCO believes that hydrogen entered the No. 4 reactor building after No. 3 was vented, through a common discharge stack or vent. Apparently the hydrogen partially did exit to atmosphere but also essentially backed into the No. 4 building. It will be important for all plants everywhere to disassociate common vents such as this to prevent a repeat occurrence of any sort. -NHK is also reporting that TEPCO will revise or scrap its cooling plan for the No. 1 plant, and perhaps the others, given the apparent inability of the primary containments to hold water. We again wonder why the primary containments are structurally unsound. Possible contributors: 1. Earthquake damage. 2. Direct core melt contact. 3. Hydrogen explosion damage. 4. Salt induced corrosion acceleration, if corrosion were already present. 5. Poor or improper welds or pipe penetrations. -TEPCO is now feeding water to No. 3 reactor through two sources; the firefighting line, which we think is going to the core top flood ports, and the feed system through the normal feed sparger ring. Temperature at No. 3 plant has been rising steadily lately. The actual dynamics of the events at all three plants differ, and while we are getting much clearer data on No. 1 plant the last 48 hours it is beginning to appear as if No. 3 plant is becoming more, not less, unstable. -There are still various news sources reporting that TEPCO still does not have the reactors under control, or that they are not shut down. "Shut down" means that the fission process is stopped, which it most surely is. "Under control" in terms of an operating reactor means steady state control of power, temperature and pressure which in the case of shut down but heavily damaged reactors doesn't really apply. This is most probably simple error or carelessness of word choice, but we know that the desire to exaggerate to get sales is all too real in the press. -TEPCO is going to fully analyze the reactor conditions at No. 2 and No. 3 plants which should lead to a flood of information about those plants just like that seen here for No. 1 plant. We expect all that within 48 to 72 hours. The situation at Fukushima Daiichi is both evolving faster than it had for a while right now and becoming clearer in terms of what has already happened and what is happening minute by minute. I will endeavor to report all of this information as it becomes available on this site as soon as possible. 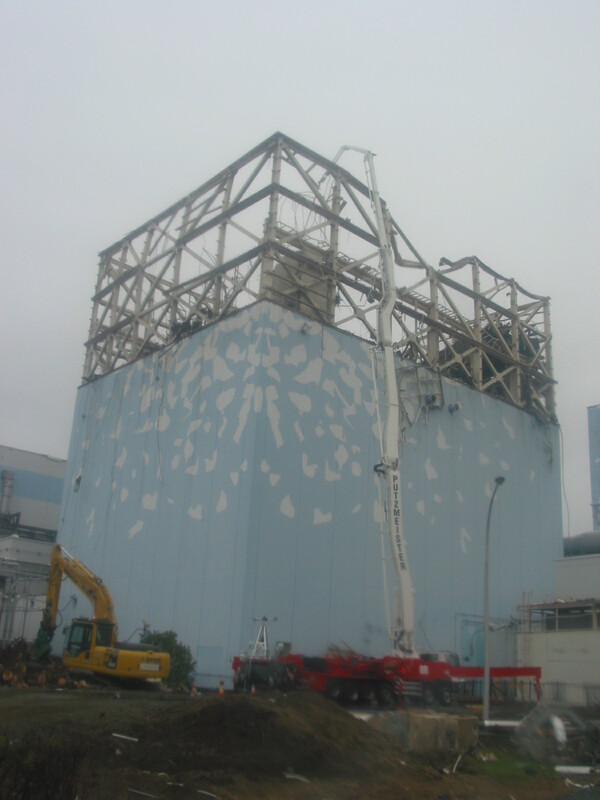 We now have a fairly thorough report from TEPCO which details the extent of core damage at Fukushima Daiichi No. 1, and gives some times for certain events on the first several days. This report contains, again, some serious information and I will detail it for you as best as possible for a very wide audience. Before going into details, let me first give some of the most important revelations and analytical impressions off the top. 1. The entire core at No. 1 plant was essentially demolished within 16 hours or so after the scram. 2. 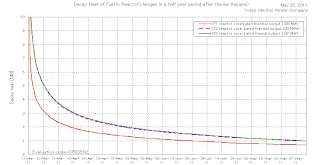 Data indicate maintained water level in the core until the time of the arrival of the tsunami. 3. 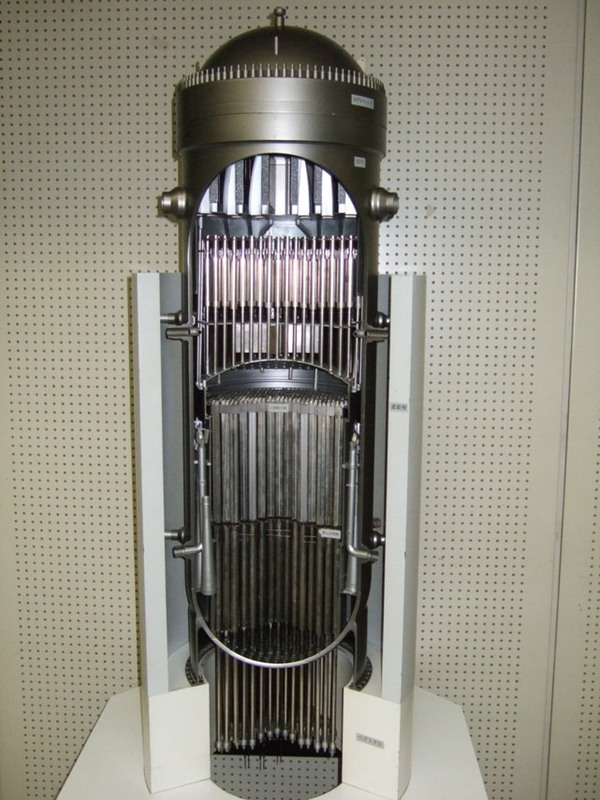 TEPCO feels that the core material is still inside the reactor pressure vessel, albeit all at the bottom resting on the lower pressure vessel head. Unfortunately TEPCO has printed "all rights reserved" on its illustrations in this press release, but we can quote data. TEPCO indicates that even though the core was destroyed about 16 hours after the protective trip (scram) it is still inside the pressure vessel, and has been cooled to some extent by water most of the time. TEPCO also feels that the relatively continuous injection of water has prevented the core from exiting the pressure vessel. At this time, the core is considered adequately cooled to prevent further release, at the very least. The high temperature seen at the feed nozzle is due to exposed fuel in the core superheating injected cooling water. TEPCO indicates that damage to the pressure vessel is likely. However, it indicates that damage isn't so severe that the corium could exit. The rationale for this assumption is the grouping of similar temperatures on the lower head and two different parts of the CRDM. TEPCO also feels that since temperature and pressure in the containment seem to move in step with primary plant changes, there is enough damage to the pressure vessel and/or piping to permit what would appear to be fairly rapid communication between the two. However, TEPCO has backed off from saying that there is a serious large breach of the lower vessel head... instead referring to a number of smaller openings. Not specifically mentioned, but important... 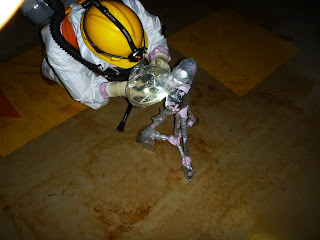 It is also clear that the primary containment is damaged and that injected water has been issuing from the primary system to the containment, and then out of the containment to various locations for a long time. -The occurrence of core damage as predicted in studies and computer modeling is as would be expected. -The timing of beginning of fresh water injection to the core again on the 12th as stated in one source correlates well with the new TEPCO indication of all the fuel being damaged or melting a half hour or so later. This is because the readmission of water would rapidly damage the already super hot fuel cladding... as surmised in numerous studies covering core re-flood. -Injection of borated seawater at 20:00 on the 12th was far too late. The first source used should have been borated. -In order to be really meaningful, we need both many more data points than the times and events given above, and reasons for each. For example, what was the reason that fresh water injection was stopped at 14:50 on the 12th? Did the injection system fail? Did the site run out of fresh water? We can go on, but it must be stressed that we cannot read TOO much into the timeline given above. It is only a first working model. As we now see, the previous BWR conclusions done in many years' worth of studies have proven essentially correct. Not that anyone thought that they would not; no one figured that the event would actually occur (long-term SBO) because of sufficient backup power. The tsunami (the true accident-triggering event, even with the latest data) was the real death blow to the TEPCO efforts on site. After the tsunami forced the plant into the true long-term SBO event sequence, it does now appear that plant behavior even with the best possible TEPCO operator action followed the expected curve and resulted in a complete core melt. What is fortunate is that it appears as if the ongoing efforts at the site during that time ensured that the core debris (corium) remained in the pressure vessel, even though the vessel was damaged. It now appears that with the core totally destroyed, that the metal-water reaction generated hydrogen, coupled with likely added hydrogen from radiolysis and perhaps even methane (as mentioned twice or more on this blog previously) would have been enough to destroy the reactor building when ignited. We will be watching very closely for further updates and particularly for estimation of the damage to the vessel and primary containment. We will be issuing some further illustrations in updates coming shortly. There are a number of very serious reports on the various Japanese news media at this moment; we will report these and make commentary in a sober fashion. NHK is carrying the report, from TEPCO apparently, that there is a hole in the bottom head of the pressure vessel at No. 1 plant. This appears to be in addition to the previously reported piping damage, although another report does indicate water leakage from piping connected to the primary plant occurring in the turbine building. JAIF's now-irregular status reports do now indicate probable damage and leakage in terms of the reactor pressure vessel and also the primary containment at the No. 1 reactor plant. Link to the most recent JAIF status report. Combining this estimation... the presence of a hole in the lower reactor pressure vessel head... with the previous information gleaned sporadically over time may in fact indicate a corium/concrete reaction has, or had, occurred. 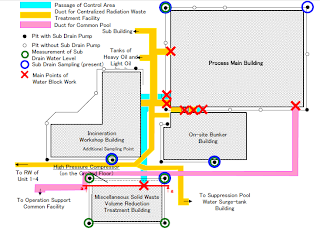 The source and routing of the large amount of hydrogen which destroyed the reactor building has not been adequately explained up until this point; partial corium exit from the reactor vessel into the dry well and the corium/concrete reaction that would result could help explain the violent destruction of the reactor building. I mentioned aerosolized fission product gases a long time ago on this blog. Seven hundred pounds of hydrogen are thought to have burned inside the containment vessel at Three Mile Island No. 2 during that core damage accident, causing a pressure pulse of about 28 pounds. 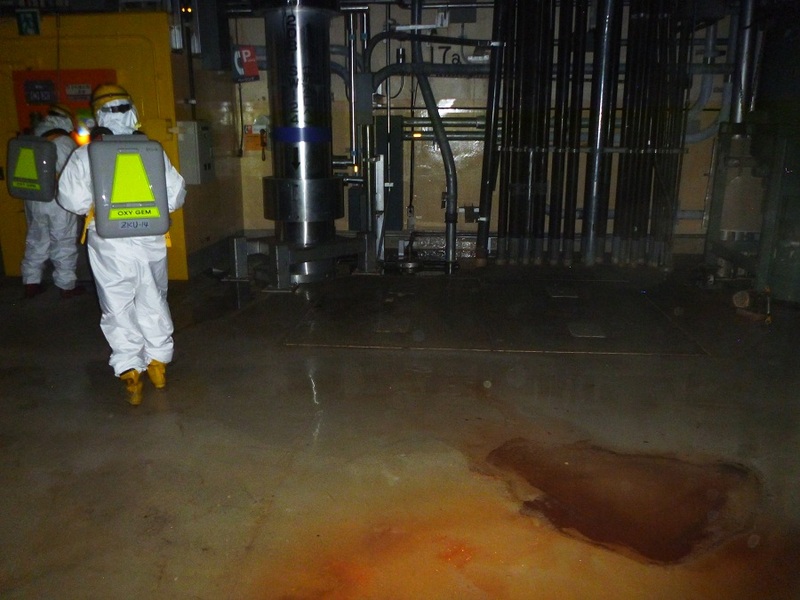 The effect of six thousand pounds, or even three quarters of that, might well explain the sheer devastation seen at the Fukushima Daiichi plant reactor buildings. It would not be inconceivable that salt played a role in the failure, either; either by corrosion, or else by blockage of cooling water, or even of sheer mass inside the pressure vessel. These effects, or others due to salt, will remain only theories until the vessel is actually opened, which could take a decade. Some studies indicate that rad levels soon after the accident might help indicate vessel failure, as well as pressure vessel pressure. Very high rad levels were reported after the accidents, and we know when the pressure began to rise in the primary containments which in two cases shortly preceded massive hydrogen explosions which destroyed No. 1 and No. 3 reactor buildings. These events... the high rad levels, and the pressure pulses, may in fact have been indicative of the pressure vessel failure(s). It must be remembered, though, that the situation we are seeing at Fukushima Daiichi is one that has only ever been postulated, simulated, discussed, calculated and proceduralized to the highest point possible but is still, up until now perhaps, totally unseen in operating reactor plants and thus is still somewhat of a gray area. TEPCO has reported over 3000 tons of highly contaminated water in No. 1 plant turbine building, with the amount increasing fairly rapidly. There is now absolutely no doubt in any quarters that TEPCO has lost containment on this plant. The reports driving this post, at least in original detail, are lacking in many specifics which is why I've made this rather long post, given the facts, with informed speculation and commentary in order that we can all as either expert observers or as lay people begin to get our heads around the possibilities enumerated by the assumption of core melt and exit of the pressure vessel, at least in part. 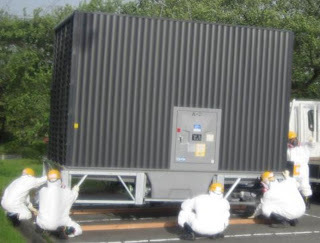 Labels: "fukushima daiichi" "tepco" "nisa"
TEPCO has released the first photos of the new cooling equipment to be installed at Fukushima Daiichi No. 1 first, and then probably at the other two plants within a short period of time. Ten units will be installed at No. 1 plant. Below, a shot of the air heat exchanger. Chubu Electric Power Company has shut down Hamaoka No. 4. The plant began reducing power at 3:30 AM Friday and the plant was off the grid at 10 AM. No. 5 plant is to follow on Saturday. This is the first plant in Japan shut down on Japanese government request, bypassing any official safety agency reviews, solely on suspected seismic risk. UPDATE 9:44 PM Eastern Friday 5/13: On the wire right now is the report that Hamaoka No. 5 plant has also been shut down. NISA has published its response to TEPCO regarding the plan to flood No. 1 plant's dry well to a height above active fuel. While present events may certainly change this policy, it might be important both for the other plants on site and for future reference to note the results of this quick but apparently thorough evaluation. And the findings are simply this: While NISA thinks TEPCO needs to ensure that no further water leakage (that is, more rapid) will result from filling the drywell and wants it to monitor injection closely, and also thinks that TEPCO needs to evaluate some strengthening of torus support in the future, it has SIGNED OFF TOTALLY on TEPCO's evaluation of the situation, of the plan, of the effects and results. In other words, the operation would have (would have had?) the desired effect. It would not have resulted in further increased threat of steam explosion or hydrogen burn. TEPCO's analysis of the seismic resistance in the condition stipulated was correct and proper. So long as no further flood exited the reactor building, and flood height did not exceed the vent line, the water was not a problem. injection amount of water, etc. improvements for its operational environment. So, while it appears that this plan probably will not be used in its original sense (in that the present estimate is that even if flooding the dry well is performed, it won't have to be nearly as high) we do see that in the previously assumed core condition both TEPCO on honest evaluation, and NISA on its review, found the plan to be workable and safe. 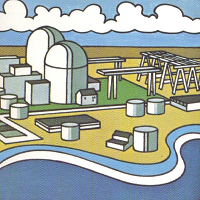 Fukushima Daiichi No. 1: Meltdown? Note: Blogger.com has been down for almost an entire day, preventing any new posts and actually removing, temporarily I'm told, some of the posts made between Wednesday and now. This was due to data corruption during a site software update. Read more at this link from the official Blogger Buzz blog. Hidehiko Nishiyama of NISA has been quoted at a press conference clearly indicating that it is the present assumption that the core material in No. 1 reactor is melted and at the bottom of the pressure vessel. The material is still inside the pressure vessel, according to NISA and TEPCO. Nishiyama has also indicated that (obviously, to this writer) the full flood of the dry well is no longer required, or helpful. Instead, TEPCO is preparing alternate plans. Meanwhile, all indications are that the core material is being cooled adequately in whatever configuration it is in at the bottom of the pressure vessel, according to NISA and TEPCO. The assumption at this time by all official parties appears to be that the core is most likely totally destroyed. The assumption also appears to be there was not a total, catastrophic failure of the pressure vessel. 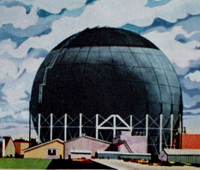 This writer wonders about the early statements by GE, and the NRC, that there might be as much as 50 tons of salt accumulated inside the pressure vessel at No. 1 plant. This seems to have been either forgotten or omitted in much of the present commentary. Given that most scenarios for long-term SBO include failure of the core support and dropping of the core to the bottom of the vessel, it's certainly plausible that this has happened. Perhaps, though, we should begin to wonder if this melted fuel material is encased in salt.. or sitting in a large mass of salt at the bottom of the pressure vessel. Perhaps, in fact, early core melt did actually cause some failures at the lower vessel head which was then plugged by the salt deposits. All of this is highly speculative. 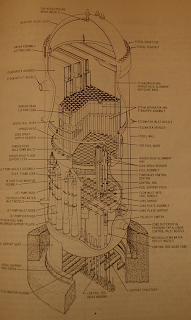 What remains unclear, even with the finding of a number of failed "welded pipes" at the bottom head of the reactor, is the total number of leak paths for all this injected water out of the pressure vessel... and then the leak paths for this water out of the primary containment. We already know where it's ended up. Another development regarding No. 1 plant... TEPCO has released the first exterior three dimensional view of the first type enclosure to be placed around No. 1 reactor building. Work to level the ground and gain full access to construct it is either underway at this time or about to start. Identical ones will follow for the other reactor buildings. Later, heavy concrete and steel buildings will be erected that will allow protection for workers engaged in dismantling the reactor plants during the decommissioning process. Below is the first type (fabric) enclosure. TEPCO has now reported, through a management rep speaking at a press conference, a number of new things about Fukushima Daiichi No. 1. -There are some welded pipe failures, amounting to a total leak area of several centimeters, now known to exist at No. 1 plant. The exact systems and locations have not been revealed. This is one source of outflow from the reactor vessel. -There may be failures of the lower pressure vessel head. This would be a second source for outflow. -It appears that the entire active fuel region of the core, when in normal condition, is exposed .. i.e. not covered with water. It may not have been since nearly the start of the casualty. -Some of the fuel has very likely melted and dropped into the lower pressure vessel head area. BWR reactors, because of their power profile, would be expected to experience fuel element melt from the center outward over a span of time without cooling. TEPCO has not given a clue as to how much of the fuel is damaged, but we noted the reduction a few weeks ago in the estimated percentage from 70% down to 55% and wonder if this won't get moved back up. Perhaps higher. Again, the exact location of the mentioned pipe holes is not known. The lower pressure vessel head failures may be one and the same... i.e. welded pipe penetrations in this lower head or the core barrel near the head flange. CRDM drive tubes are also likely candidates if a molten fuel pour occurred. Speculation is now wide in the media and among knowledgeable persons that TEPCO will not meet its previously stated timeline for recovery. ...What is surprising to this author is the apparent surprise among some other supposedly knowledgeable people that the water in the turbine buildings has been coming all along from the feed and bleed cooling of the reactors. Today I have seen at least two stories in big media where purported nuclear engineers are quoted as saying that "there is raised the possibility that this water is coming from the reactor buildings, having come from the reactors themselves" or some such. This is not a surprise, has been the case all along, has been the cause of all of the highly contaminated water found on site and in the ocean and frankly anyone acting surprised about this now should be embarrassed. We will post more details when they're available. The Japanese media outlets are reporting a downgrading of the condition of the reactor pressure vessel, in estimation, at Fukushima Daiichi No. 1. Now, TEPCO is saying that a serious leak in the pressure vessel has prevented the water from rising any higher even with the increased injection rate. The water, as guessed a number of times, is probably going to the primary containment. Both TEPCO and NISA have apparently now decided that some fuel melt and relocation to the bottom of the pressure vessel has occurred, but also indicate that ccoling of the fuel in No. 1 plant is adequate for the moment. 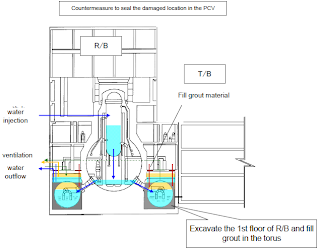 I speculated a long time back here on this blog that it was conceivable that fuel melt had occurred, relocation had occurred, and that perhaps failure of one or more reactor pressure vessel bottom head penetrations had occurred. However, many other experts (including the US NRC) felt that the fuel was still located in the normal area, i.e. above the core support plate and this became the assumption everywhere. It may in fact be that I was correct all along. We shall see. I would just add that many simulations and investigations by ORNL and others into serious core damage events at BWRs predict such bottom head failures, or else failure of the pressure vessel circumferentially in some cases. Regardless, what TEPCO is essentially saying is that the leak rate is sufficient, given the newly operable water level indicator. We don't yet have a solid number, incidentally, for the water level; one media outlet is saying that the water level isn't even indicating there is water in the pressure vessel any higher than one meter below the bottom of the normal fuel zone. This could conceivably indicate a serious breach in the recirculation piping (breakage, failed pump seals, or both) or a leak in the lower head. It is of interest that the outlet nozzle for the recirc piping is slightly below the level of the core support plate... if the drawing we have here for this reactor is correct. This surely seems to indicate that the only feed into the reactor is outside the core barrel (feed ring? ), since with failed recirc piping and feed inside the core barrel there should be the ability to keep water level at least at the level of the jet pump stand pipes as we've shown here before. Feed going down the outside of the core barrel, only to be released through the failed recirc piping, would explain this situation. If there IS feed inside the core barrel (say, the top spray) and water is this low, this indicates a lower head failure. There are sure to be more details released as TEPCO and NISA decide on any changes in the course of action... but for now, the plan should be the same: flood the dry well. A new CNBC video describing what the Fresno Nuclear Energy Group is proposing... a pair of French-built reactors to be built near Fresno, California for the purpose of water desalinization. While detractors are already all over the place, the premise is at least worth listening to once. The Fresno Nuclear Group's site, http://www.fresnonuclear.com is presently down. TEPCO rapidly halts water flow to cable pit at No. 3 plant. TEPCO has discovered a leak of contaminated water into a pipe trench, or pit, almost the same as happened at No. 2 plant but this time the discovery has been made at No. 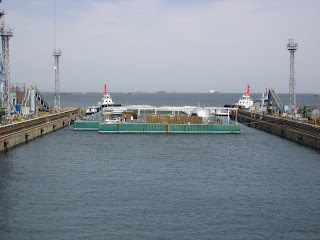 3 plant's seawater intake area. Below is TEPCO's illustration. The last time this happened, TEPCO was forced to inject what it called "liquid glass" into the area around the pipe trench, at Unit 2 in a similar location. This is not to say that this leak path is identical. NISA has instructed TEPCO to analyze the leak source and stop it as fast as is possible, and to examine impact on the seawater. TEPCO will certainly move rapidly on this, given the known contamination levels of the various bodies of water inside the plant buildings and the impact that a similar leak from No. 2 plant's pipe tunnels had on the level of contamination of the seawater outside the plant. pm on April 2nd, we reaffirmed the event at the scene. sent to Fukushima Daini Nuclear Power Station for analyses. of water to the ocean from the crack on the concrete lateral of the pit. the pit and the seawater in front of the bar screen near the pit. (iodine 131, cesium 134, cesium 137), we report those as definite results. and Industrial Safety Agency (NISA) on April 1st." Judging from these previous actions, then, TEPCO should be able to get this newest leak stopped in several days. In other Fukushima Daiichi news.... TEPCO has begun adding Hydrazine to the water being injected into the spent fuel pools to halt corrosion. Feed nozzle temperature at No. 3 plant was about 192C at 6 AM on the 11th; the latest figure is 214.5C at 11 AM on the 10th. This increase is beginning to look worrisome; TEPCO needs to accelerate its efforts to cool this reactor plant. Looking at data from JNTI, the rate of increase is itself increasing. Finally.. work continues at No. 1 plant to get both water level indication and pressure indication back for the pressure vessel. So far none of the technical sources has reported anything other than the previous data (water level still stuck reading -1650mm) so we'll assume this work hasn't been successful yet. UPDATE 12:25 PM Eastern: TEPCO has stopped the leakage at No. 3 plant's cable pit through the use of fabric in the trench, and concrete. As work at the site really gets heavy in all areas of restoration, the news is beginninng to come out of Fukushima Daiichi fairly rapidly. Here are some of the most important updates I've seen. -TEPCO has released a video of the spent fuel pool at No. 3 plant showing massive amounts of building debris in the pool. The debris includes steel I-beams, concrete and building material rubble, and masses of reinforcing iron bars as well as cables and other miscellaneous material. In fact, it's practically impossible in the video released to make any estimation of spent fuel condition because you can't see it. -TEPCO indicates that calibration of water level indicating equipment at No. 1 plant is underway, in the effort to get the active fuel region covered with water. 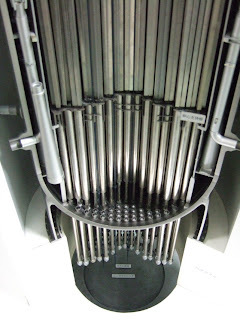 Contrary to some assertions elsewhere on the Internet, there is still apparently no direct flowpath THROUGH the fuel region of the reactor since injected cooling water is running down the outside of the core barrel to the egress points at the jet pump standpipes... if the TEPCO information about the actual feed injection point up until now remains valid (ie, the feed ring.) This allows heat removal from the core barrel, which itself is transferring heat from the fuel. However, the new plan is to raise water level in the dry well above that of the jet pump standpipes which will then allow internal level (inside the core barrel) above them as well. New feed into the core barrel will be established, along with the feed through the normal sparger ring as up to now. We published that drawing (for the new arrangement with dry well filled) a while back on this blog. -Hampering the efforts however at No. 1 plant is the radiation level. While TEPCO has brought in some lead embedded sheeting, this material (which we understand is more blanket-like than steel plate-like) is not reducing the rad level as much as TEPCO would like in work areas, which has led to the slowing of some efforts. -Over at No. 3 plant, temperature continues to rise slowly with last report of lower pressure vessel head temperature now at about 151C, up over 30 degrees in a week. TEPCO has now revealed that it altered the flow path for injection water at some point in the past. Temperature has risen slowly over a period of about one month. TEPCO is shifting back to its first injection path for this plant, which it hopes to be using by Thursday. 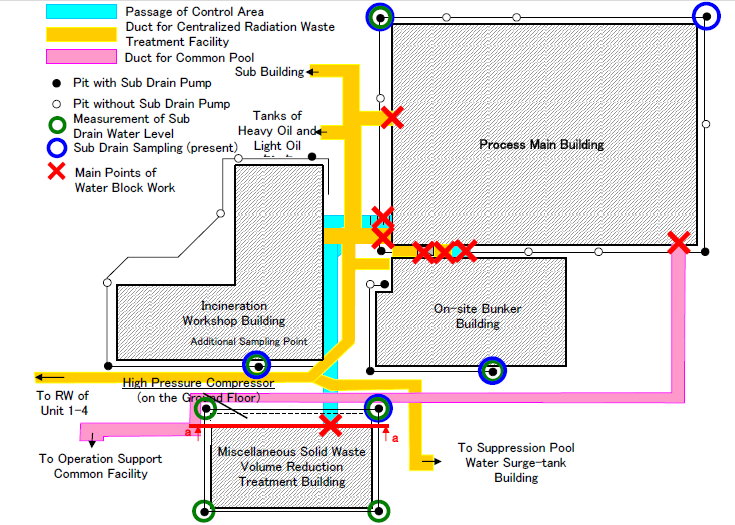 We don't have a piping diagram from TEPCO yet to illustrate the change in flow path. TEPCO has released some new official photographs of equipment specially prepared for use at the Fukushima Daiichi site. 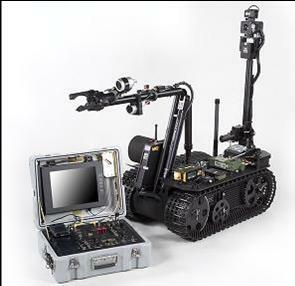 First is a smaller machine, the QinetiQ TALON, along with its remote control unit. Next is a Bobcat T300 compact track loader. 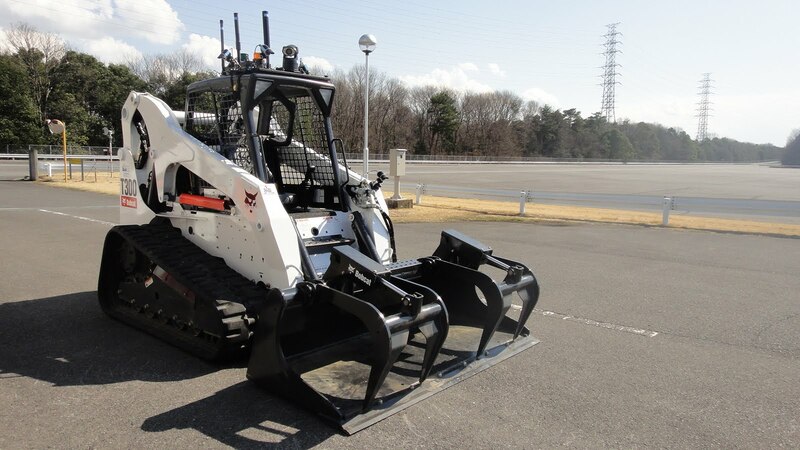 These Bobcats, when fitted with what Bobcat calls its Selectable Joystick Control system, are available from the factory with remote control. Note the cameras fitted to the machine in various locations. 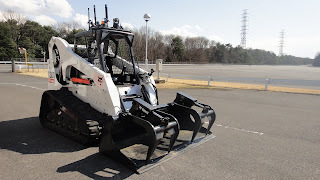 And, here is a link to Bobcat T300 data at Bobcat Company's site. A small piece of remote controlled construction equipment is shown next; this is the very interesting BROKK 90 in a press photo supplied through TEPCO by the maker of the equipment, TAISEI corporation. 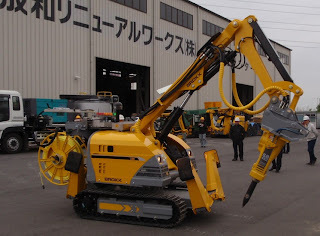 Notable are the dual attachments; a pincer type attached to the arm, and a clamshell bucket type. Also of note is the fact that a piece of equipment this size has outriggers for stability, seen deployed in this illustration. 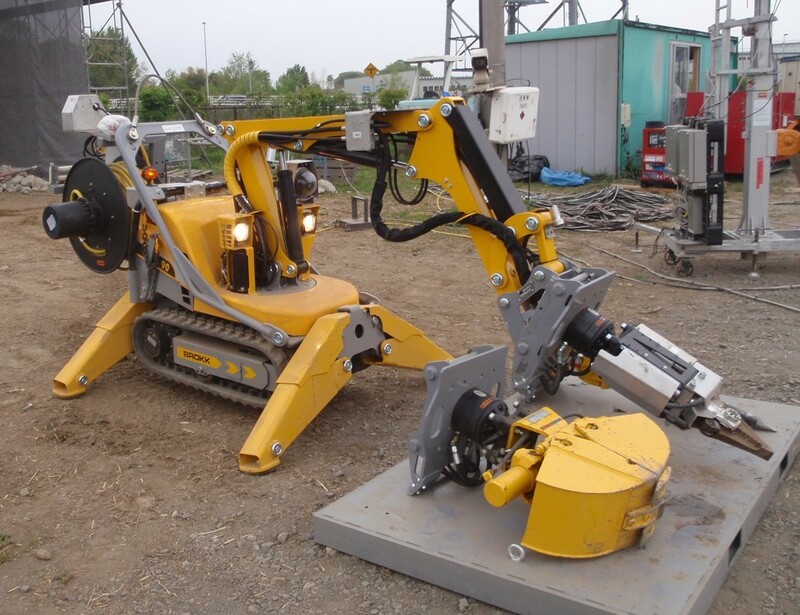 The Brokk 90 is an electro-hydraulic unit, incorporating an 11 KW electric motor to drive hydraulics that operate the rest of the machine. See details here. Also shown is the much larger Taisei BROKK 330, again through TEPCO courtesy TAISEI. Taisei does not feature the 330 on its site; it appears to have been replaced with the 330D diesel powered model. This Brokk 330 appears to be powered electrically like the smaller Brokk 90 seen previously. This makes sense, given the confined nature of the spaces in which these machines will work. As we might have expected, and had read scattered echoes of, there are indeed some quite high radiation levels inside No. 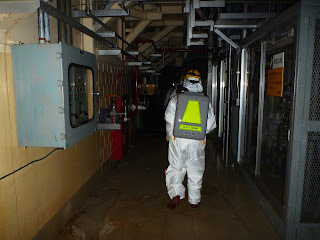 1 reactor building at Fukushima Daiichi. Right now Kyodo is reporting a level of about 70 R/hr which has been detected in one area... where that is exactly, we don't know. With the known fuel damage, rad levels of this caliber are not surprising; surely, portable and temporary shielding will have to be brought in, and rigid stay times enforced. We'll give more data as the work continues in No. 1 and more readings are revealed. Chubu Electric Company's board has agreed to shut down No. 4 and No. 5 plants at Hamaoka, and to not restart No. 3 which is under inspection. We don't have a time for the shutdown yet. -Chubu Electric intends to hold another board meeting very soon (probably early this week) to decide what to do about Naoto Kan's request to shut down all reactors at Hamaoka. We also have a new video this morning from TEPCO taking a much longer look in the spent fuel pool at No. 4 plant. Labels: "chubu" "hamaoka" "tepco" "fukushima daiichi"
The Japanese Government request to Chubu Electric Power to shut down all reactors at the Hamaoka site results from studies showing that the plant sits above a focal point for what has apparently been a long-predicted earthquake which hasn't happened yet but could hit 8.0 magnitude and could occur within 30 years. Chubu Electric Power has announced it will agree to the request and shut down the operating plants No. 5 and No. 6 at the site, and not restart No. 3 plant. The earliest two plants at the site are already in the midst of decommissioning. There is the possibility that, after extensive studies and perhaps plant modifications if required that the three operable reactors at the site could restart. This seems probable, given the Japanese plants' known earthquake resistance. Keep in mind that the Fukushima plants survived an earthquake in excess of that for which they were designed, only to be inundated by the tsunami a short while later. To our knowledge these are the first plants anywhere to be closed down after the Great East Japan Earthquake simply based on their proximity to known faults, or focal points for earthquake shock, or tsunami threat .. or really any natural disaster threat... without having actually experienced any casualty whatsoever. UPDATE Saturday 5/7 5:45 AM: Now, NHK is running a story saying the opposite; in other words, that Chubu Electric's board of directors has not yet decided to acquiesce to Naoto Kan's request to shut down the plants. Clearly this situation is fluid (as is the relationship apparently between government, agencies of that government, and utilities) and we'll keep watching to see which way the axe falls. At this early hour (at least here in the US) there is a news item running right now only on Kyodo News saying that not only will the Japanese government NOT allow Chubu Electric Power Company to restart Hamaoka No. 3, it will also ask Chubu Electric to shut down Nos. 4 and 5. We'll post more details later today when they're available.